The author, J.D. Means, gave me a copy of this novel in exchange for my review. There are some things that are at odds for me in Millie and Honey – The Blue Angel Planet. The novel is written in a style suited for young readers just transitioning into chapter books and introduces them to serious emotional content involving abandonment and cruelty that readers of that generation may not grasp. Millie is 15, but to my ear read quite a bit younger in her reactions and dialogue which will help younger readers bond with her character. She is a character that demonstrates for children the reasons and rewards behind being responsible and helpful. Children 6 – 9, will soak up the talking dog of this novel. Honey is Millie’s co-conspirator within the piece. She is friend, partner in crime and the nurturing and calming influence on the characters met. Honey reads as motherly while leaving her fellow characters with the independence that children like to read. There’s a feeling within the narrative of “this happened and then this happened and then this happened” all of which are big action moves that read as vignettes in a combined longer piece. Millie and Honey – The Blue Angel Planet is a story for a short attention span. If you have a child who listens to one chapter of a book and then wants to run off to do something, this may be the perfect novel for them. It is a work with very easy stopping points. The illustrations in Millie and Honey – The Blue Angel Planet are representative of the work, colorful and in the case of the dog on the unicorn’s back, adorable. My favorite illustration was of the waterfall. Looking at the picture there is a feeling of life and being drawn into the setting. Children will be attracted to the recognizable illustrations and breeds of canine and the idyllic and brightly colored settings. My favorite part of Millie and Honey – The Blue Angel Planet was the poem “The Yorkshire Terrorist” at the end. My sister-in-law and niece have Yorkies and I can attest to the veracity of their interpreted nature in the work. If you have a 6-9 year-old new reader, pick up Millie and Honey – The Blue Angel Planet for an easy and entertaining read. J.D. Means is a native of Youngstown, Ohio who now lives in the United Arab Emirates with his wife and dogs. He wrote the Millie and Honey series to entertain his wife as they waited for their pets to clear quarantine when made the international move. 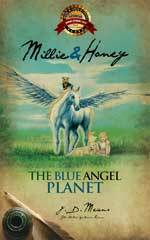 Millie and Honey – The Blue Angel Planet is his third novel in the Millie and Honey Series. For more information about J.D. Means, visit his website. You can connect with him on Goodreads, Facebook and Twitter @millieandhoney.